God told Mary and Joseph to go to Egypt. And they did. They lived there with little Jesus for two years. While they were away, King Herod told his soldiers to kill all the baby boys born in Bethlehem. He had heard the stories, and he didn’t want anyone to grow up to be king. But Jesus was safe in Egypt. When it was safe to go home, Mary and Joseph went back to Nazareth. Jesus was a happy boy. 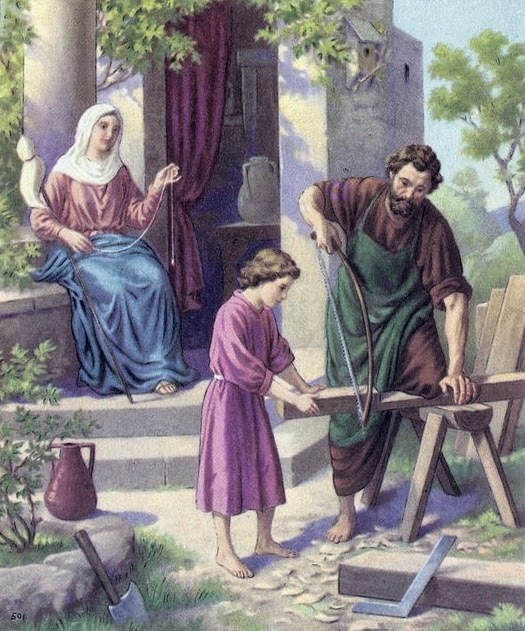 He helped Joseph in his workshop. Mary and Joseph loved him very much. And they took good care of him. Mary and Joseph took Jesus to a big city called Jerusalem. While they were busy, Jesus went off by himself. Mary and Joseph looked everywhere for went into the temple, and there the boy. Finally they went into temple, and there he was! He was telling the teachers about God. Mary and Joseph took him home he was! He was telling Jesus said “I wasn’t lost. I was doing my Father’s work.” Even then, Jesus knew that his father was God.